Enjoy all the hot water you and your family need for up to 50% less of what it’s costing you today. And since water heating is one of a household’s largest energy expenses, it’s a strategic area in which to maximize efficiency. Your cooperative can help with your investment. Financing available in some areas. Check it out today. The cost of electricity fluctuates depending on how much of it is being used at any given time. ETS Water Heaters take advantage of this by drawing electricity during times of low demand (such as overnight), when it’s less expensive. They use this bargain electricity to heat the water stored inside their Envirofoam®-insulated tank, which allows only 5ºF of heat loss in 24 hours. With this innovation, you’ll have hot water whenever you need it, for less. ETS Water Heaters are easy on electricity, but that doesn’t mean they’re not tough. Built here in the U.S. with water-tight polyethylene materials, they resist damage and rust in any environment. On average, a water heater needs to be replaced every 10 years. But the ultra-durability of these ETS Water Heaters is backed by a lifetime warranty, leaving you with fewer worries, and more peace of mind. Lightweight yet heavy-duty, ETS Water Heaters can be installed without the need for special equipment. 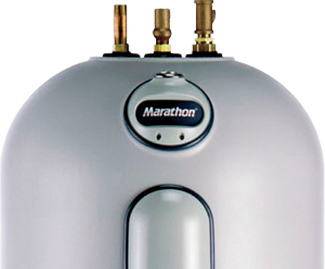 This reduces the time, cost and headache of getting your water heater up and running. For professional installation services, contact your cooperative. 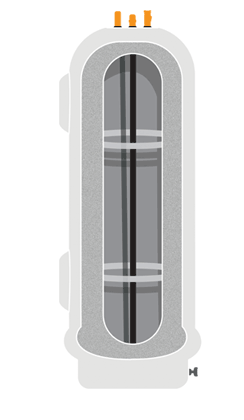 An anti-scald device blends hot water with cold water to ensure consistent faucet temperature and reduced hot water consumption. 2.5 inches of foam insulation minimizes standby heat loss, keeping water hot and ready to use. Tanks are available with a capacity of up to 105 gallons, allowing for even large families to enjoy water heated by off-peak energy all day. Heating elements are in direct contact with water, minimizing heat loss for near 100% efficiency.